Quick answer: The best simple shaker bottle is the BlenderBottle Classic. 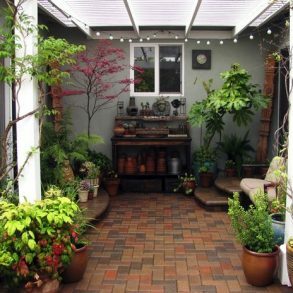 Its simple and effective design has been proven by its popularity and widespread usage. 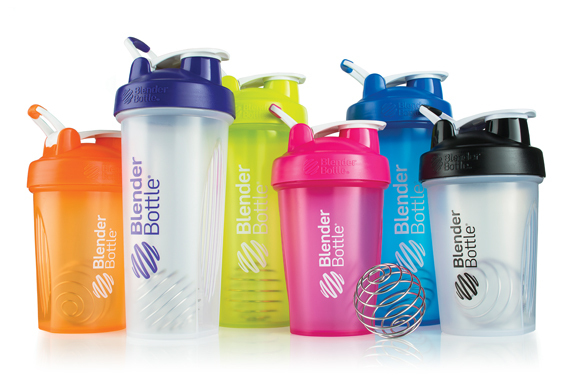 But if you want a more ergonomic shaker bottle, we suggest upgrading to the BlenderBottle SportMixer. 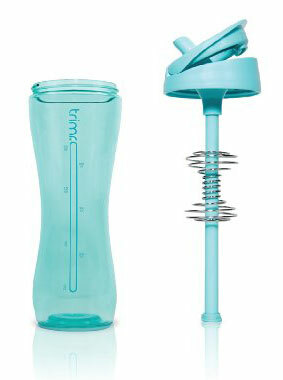 If you really want to stand out with a very pretty and versatile shaker, look no further than the TRIMR shaker bottle. While these are great mixers, there is also the Cyclone Cup which is excellent for mixing heavy and thick supplements. And if you’re really serious and want an electric supplement blender, the best out there is the Promixx Vortex Mixer. You’ll see them in almost every gym or you might even already own one. They come in all sorts of colors and interesting designs, but their function is the same — to mix your supplements! Shaker bottles are fantastic for quickly blending protein powders, smoothies and other supplements with your chosen liquid. They are designed to quickly and efficiently mix your ingredients through the use of an agitator. With the fitness industry booming these days, the shaker bottle market has grown producing more advanced designs and bringing new competition. Having gone through multiple shaker bottles over the years, we can tell you that clumps in protein shakes don’t taste great. That’s why we’ve taken the time here to go through and analyze what makes a great shaker bottle and which ones have consistently avoided powder clumps and accidental leaks! There are many shaker bottles out there, especially ones from supplement companies trying to upsell you. 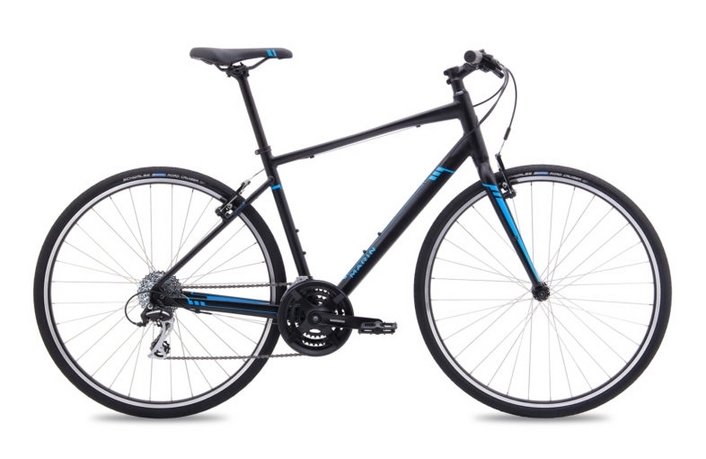 But the simple truth is that a lot of them are cheaply made and there are plenty of better options to pick from. Having a good shaker bottle won’t dramatically change anything, but it does reflect your own commitment to fitness and in a strange way is sort of a companion on your personal journey. It is a subtle reminder to be consistent with your supplements and fluids and to take your fitness commitment seriously. For this, we need to understand what makes a good shaker bottle consistent, useful and easy to use. It’s relatively straightforward — it needs to have an effective agitator and easily mix supplements without clumping, be made with high quality materials, easily drinkable, doesn’t spill or leak, portable, easily cleanable, and it needs to avoid retaining odors after usage. Seem like a lot of requirements? Maybe so, but if you’re regularly taking supplements then you’re going to want a shaker bottle you’re happy with and aren’t hesitant to use. The best simple shaker bottle is the BlenderBottle Classic. The BlenderBottle brand has been around for a long time and has consistently made quality shaker bottles with a wide range of colors, styles and sizes. 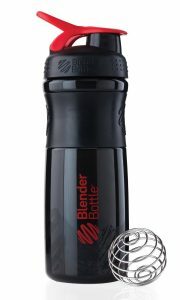 In fact, the BlenderBottle Classic is the first shaker bottle I ever owned. I used it for years and it still works great. The BlenderBottle product line easily has some of the most popular shaker bottles out there because they are reliable and effective. Their products use a unique stainless steel wire whisk they call the BlenderBall that acts as an agitator to quickly mix your supplements without clumps or lumps. The overall design of this shaker bottle allows for easy use, plus there are only 3 parts to clean. It also comes in varying sizes of 20 oz, 28 oz, and 32 oz. You can either get it with a loop top (which we prefer), or without the loop top. The loop top just allows you to attach your keys to your bottle while you’re working out, or to even attach your bottle to your bag. The screw on lid also makes it very leakproof and provides a good seal that doesn’t make you hesitant to use it. The Rubbermaid Shaker Bottle is comparable to the BlenderBottle Classic. It has an interesting finger loop for easy carrying, is disherwasher safe, and odor and stain resistant. It is also noticeable for its high build quality and thick Tritan plastic while also being crystal clear. 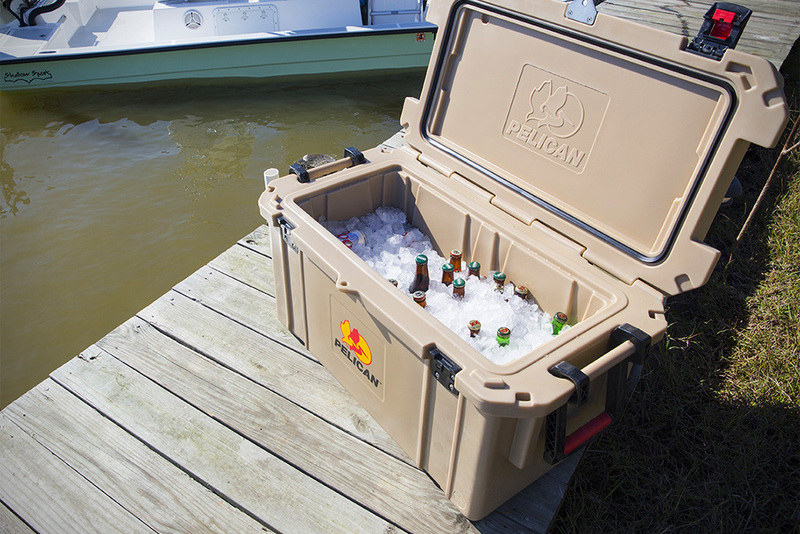 The twist-lock lid also seals very well without leaking any issues with leaking. The Contigo Shake and Go Mixer Bottle is also comparable to both of these. However both the Rubbermaid and Contigo have one big difference — they have a plastic agitator that can be a bit noisy when using. BlenderBottle’s wire whisk is much quieter in comparison. Admittedly however, the heavy harder plastic agitator actually works extremely well. The Contigo Bottle is also a very thoughtfully designed shaker bottle with a rounded bottom that appears to help prevent powder clumping on the bottom. It seals very well and has a simple but efficient design. The big handle is also convenient when carrying it around the gym. 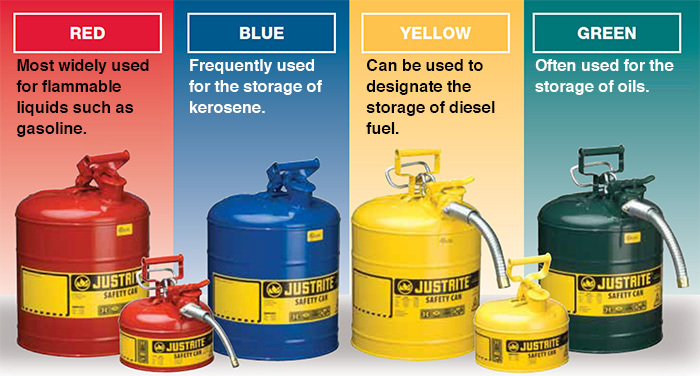 There are a few more basic shaker bottles we looked at but disregarded. This includes the Optimum Nutrition Shaker Bottle which has many poor reviews and many customers have had issues with it not sealing properly. Another popular but unfortunately disappointing product is the Umoro One. It is not as hygienic as we hoped with it being a little difficult to clean. It also has a coating on it that tends to have dirt and other particles clinging to it. While it does have rubberized seals and mixes powders and liquids very well, there are better shaker bottles for the same price. There is quite a bit more variation if you’re looking for a premium shaker bottle and are interested in stepping it up a notch. We decided on three distinct premium shaker bottles that are all high quality but different enough to be listed here. It will come down to personal preference since their prices are all very close. One of these favorites is the TRIMR shaker bottle. It is a very interesting shaker bottle that differentiates itself by having both a flip straw and a chug option for drinking. This is the only shaker bottle that has a straw and we found ourselves drinking more liquids than we normally would just because of how easy it was to sip on. The only issue we found with the straw is that it doesn’t reach all the way to the bottom, so you’ll sometimes find yourself chugging the last bit instead of drinking from the straw. But that’s also the cool part of it, you have the option of chugging your drink whenever you want or just sipping it as you go. The straw is also part of what they call their Piston-Mixing technology. This involves a unique stainless steel agitator that slides along the strong when you shake it, and it actually works rather effectively. We very rarely had any issues with clumping or leftover powder. We also really appreciate the fact that it fits perfect in cup holders so we can also use it as our daily water bottle in our car. You can even remove the straw and metal agitator if you want. The TRIMR definitely leaves you with the feeling of a high quality bottle that was very carefully designed. Its certainly one of the better looking shaker bottles out there. Plus the fact that it is BPA-free, phthalate free, and built with Tritan plastic to resist odors adds to this. The bottom also has a rubber base that prevents it from slipping. This bottle originated on Kickstarter with a small team, and from out experience so far has had excellent customer service. Our only issue with the TRIMR is that the chug latch can be difficult to open occasionally or you might think its securely closed and sealed when its not. This has called a couple leaks in our experience which are largely due to user error. There isn’t a noticeable way to check that its securely sealed without pressing down hard on the top, because sometimes the chug latch will be slightly open without you realizing it. This has caused it to lose a star on Amazon, but we still think this bottle is worth it overall and doesn’t detract from the positives. We consider the TRIMR to be one of the top premium shaker bottles out there and it comes in a number of beautiful colors (our favorite is mint). The Cyclone Cup comes in 9 different colors. Another personal favorite is the Cyclone Cup. This is a popular shaker bottle with a very effective static, plastic agitator at the top. To blend supplements, the Cyclone Cup uses their patented Cyclone Mixing Technology which they claim mixes better than other leading shaker bottles. Admittedly, it has been fantastic for mixing heavier protein powders and thicker pre and post-workout supplements. Wire whisk balls for example, don’t work as well as a stationary agitator because a whisk balls tend to flow too randomly with the fluids and sometimes miss powder resulting in clumps. This design forces the liquid and powder to flow and hit against the agitator to maximize blending potential. We have been impressed with the agitator and the overall functionality of this shaker bottle as it has created one of the smoothest and creamiest blends we’ve tasted. It reduces the overall amount of shaking required, and there is also no plastic ball banging around to make noise. The lid screws on very tightly and has rubber grips on it allowing you to tighten it even if your hands are a little bit wet. The lid is also flat and reduces the chance of the mouthpiece being damaged while in your bag. It also has a 6 oz dry compartment storage on the bottom which saves the hassle of storing your powders in a separate container. The small details of a shaker bottle are what make a standard shaker bottle a great one. 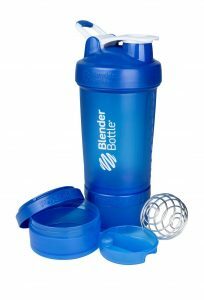 The BlenderBottle SportMixer is another effective shaker bottle that is an updated version of the BlenderBottle Classic. It has a no-slip rubberized grip which makes shaking it a little bit easier, and combined with their patented BlenderBottle wire whisk makes it very good at mixing your powders and liquids. It has an ergonomic flip cap and spout that allows for easy drinking and designed so it doesn’t close on your nose while drinking. As usual the screw on lid gives a very leakproof enclosure while the entire bottle is BPA free and made with odor and impact resistant Tritan plastic. Overall its a good upgrade over the classic version, and you’ll be very satisfied with this shaker bottle. Stacking shaker bottles are great for when you don’t want to pre-mix your drinks or carry an extra container for your powders and supplements. 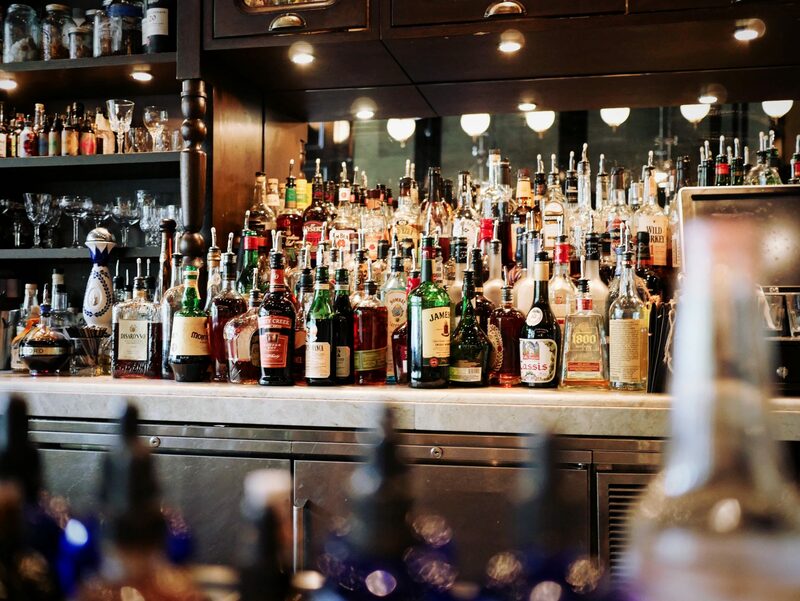 When we refer to stacking shaker bottles, we mean that they include a separate compartment that allows for easy storage of powders, pills, liquids or even snacks. The Cyclone Cup that we picked as one of our favorite premium shakers does have an extra compartment for powders, but there are other shaker bottles that provide better storage when you need to store more. Our top pick is the amazing Spider Bottle Mini2go Elite 25 oz or the larger Spider Bottle Maxi Shaker Bottle 32 oz. It provides the most amount of space in a single bottle while also having two storage compartments and an extremely effective stainless steel whisk at the top. This bottle was designed by the GSI (German Sport Innovation) team that focuses on high quality and functional design. They’ve really done an excellent job with this bottle and it’s marketed towards athletes and others who require a lot of supplements. It has two storage compartments that unscrew on the bottom which gives enough room for both pre, intra and post work out supplements. The static agitator is very effective for thick, heavy powders and looks like a spider web (hence the bottle’s name) that sits at top of the bottle. We actually found it more effective than the wire whisk balls that are sometimes inconsistent with heavier powders. The plastic material is also very tough and will endure multiple drops, and because there are only a few simple parts it is very easy to clean. 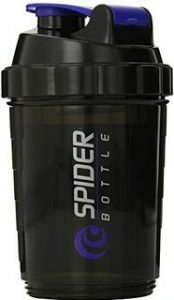 We recommend the larger 32 oz Spider Bottle Maxi Shaker as the best stacking shaker bottle for high performing athletes. You will be happy with it for a very long time. Our runner-up is the 22 oz BlenderBottle ProStak (BlenderBottle really does have a good product line) which is essentially their classic bottle with two interlocking storage compartments (150 cc and 100 cc) and a pill tray that slides inside one of the two storage compartments. 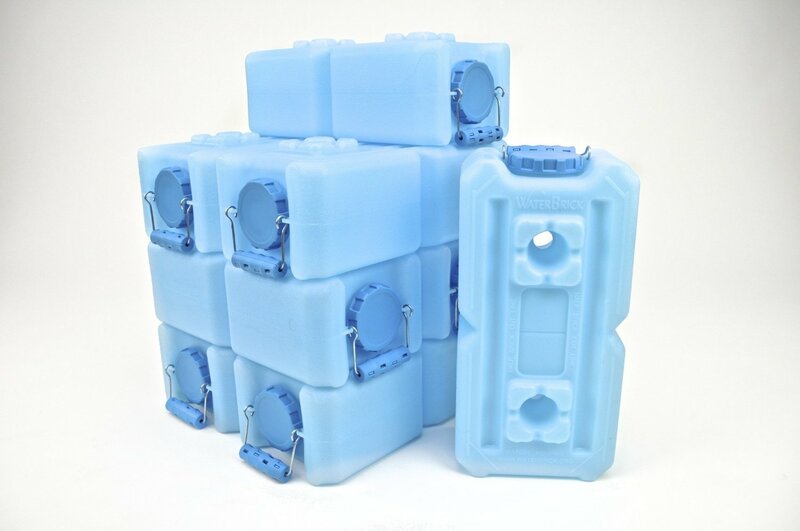 They call their storage compartments the GoStak container system (you can buy additional 2-Piece 250cc Expansion Paks or the 4-Piece Expansion Pak). Note, in the 4-piece expansion the pill tray is counted as one of the expansion packs, and the rest are 250cc, 150cc, and 100cc compartments. As with the other BlenderBottle products, the shaker bottle is BPA and Phalate free, uses the same BlenderBall wire whisk and is overall a very high quality product. We also took a look at the SmartShake Shaker Cup which comes in both 20 oz and 27 oz, but too many users had problems with the drinking cap breaking or quality control issues in general. Aside from that, the usability was good and the Snap-On strainer was effective. There are also two storage compartments, one for pills and another that can store 70 grams of powder. However, a few users noticed occasional sweating on the bottle which caused clumping where the powder is stored. While functional overall, the quality control concerns and the sweating have caused us to put our recommendation in other shaker bottles. There aren’t many good electric bottle shakers out there, but the Promixx currently wipes the competition. It has a great ergonomic design, 600 ml capacity, and a detachable motor when you just want to take the cup with you. It uses a special x-shape blade design to create a vortex within the bottle. Simply press the button and let it blend for 10 seconds and turn it off. It does require 2xAAA batteries that it does not come with. We suggest using rechargeable batteries to save money. 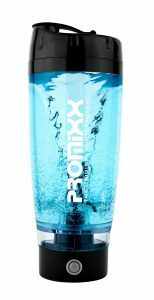 The Promixx is great for mixing heavier supplements and powders without clumping. It is more expensive than a standard shaker bottle because it has a motor, but it does exactly what it advertises and does it well. It was even quick to mix thick peanut butter when we added it to our protein shake. 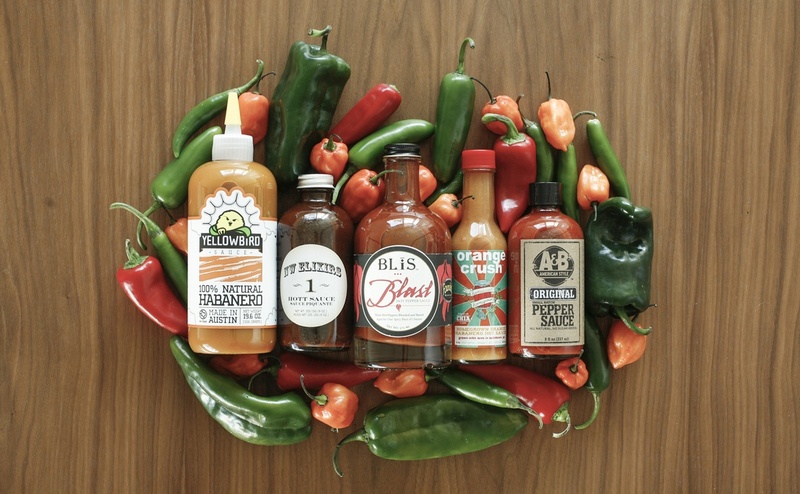 There is also a distinct taste difference for blended mixes versus shaken ones — blended tastes much smoother. Cleanup was easy requiring less than 10 seconds with a single drop of detergent and some water. You can also just put it in the dishwasher as long as you remove the motor section. It is important to note that having good batteries does make a difference. Some users have noted issues with decreasing power, but this is generally due to cheap batteries. Rechargeable eneloops work the best. We also tried 3 scoops of whey with milk and were impressed with how easily it mixed. The drinking piece does take some getting used to but we grew comfortable with it quickly. The drinking hole is a bit small and it would be difficult to chug your entire drink at once, so it forces you to stop and take a breathe which we didn’t mind. Surprisingly it also doesn’t make much noise. In contrast, a shaker bottle with a plastic ball makes much more of a racket. Its also small and compact enough to sit comfortably in a cup holder. Now, if you are looking for something more powerful, there is also the newer but more expensive Promixx 2.0 16,000 RPM. The main differences include a brushed aluminum base finish, transparent lids, improvements to the whisk for more efficient mixing and a rechargeable lithium ion battery which is also chargeable through USB. Make sure you put in your liquid in before you put in any powder or other ingredients. Always make sure your bottle, lid and cap are securely closed before shaking! Trust us..we’ve had one too many messes created due to forgetfulness. When adding supplements, it is also best to first add 1/4 or 1/2 liquid, then add your powder, then add additional liquid. 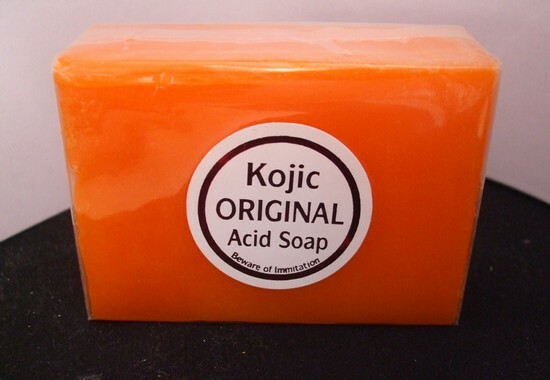 This is optimal to avoid any sort of powder clumping on the bottom or the top and will create the smoothest blend. And in case we need to remind you, make sure you don’t use these bottles for hot liquids unless it is specifically designed for it. Its always good to wash your shaker bottle each time you use it to prevent any sort of bacteria build up or residue from remaining. It is best to simply use some warm water and dish soap to clean your shaker bottle out. If your bottle is dishwasher safe, then place it in the top rack of your dishwasher during your next cycle. Then simply air dry your shaker bottle to avoid anything from starting to grow on it! Now every once in a while you might notice your shaker bottle starting to smell sour or a bit off. If an extra wash with dish soap or through the dishwasher doesn’t get rid of the smell, try two tablespoons of baking soda and fill it with warm water. Seal and shake as if you were mixing a protein shake. Let it sit for an hour, shake it a couple more times and let it sit for a couple more hours. Rinse your shaker bottle out and smell away!